If there is one thing that comes to mind with the ESRI Press it is probably that book about VBA and ArcGIS. Yea not exactly stay up late reading material at all. Last year ESRI brought an out of print book back that many GIS professionals had lusted after since they were told of its existence. Cartographic Relief Presentation was on the short list of many folks and a hugely welcome edition to any cartographer. Well following up on that book, we’ve got a new one out now,?The Look of Maps: An Examination of Cartographic Design. What I like about this book is that it gives focus on techniques, not technology, which is something sorely missed by today’s books and instructions. The “why” of what makes good cartographic design is becoming a lost art. But that isn’t all, I saw in the ESRI Press Catalog that another book is on its way this fall. Semiology of Graphics is yet another book that teaches concepts, not technology and helps cartographers make great decisions about presenting their data. So much of computer GIS is devoid of good cartography reference books to give GIS professionals guidance to make timeless maps, not just those with the default ESRI north arrow on them. I highly suggest putting these books on your Amazon wish list as they are valuable as they are timeless. 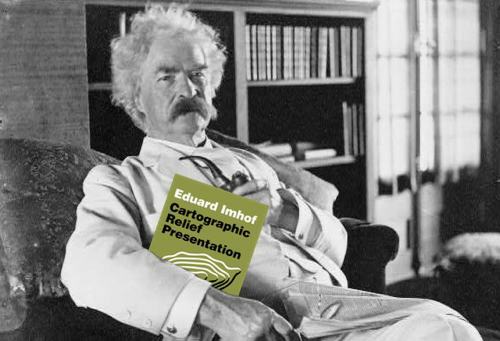 Photographic evidence indicates Mark Twain was a big reader of cartography books.